April was a super busy month for me, which is why I only posted once during the whole month. I went from being super motivated in March to completely burned out! It was incredibly frustrating. I wanted to write (both posts as well as my book) but when I would sit down, I found myself staring blankly at the screen. I had no energy. I just wanted to relax or take a nap. 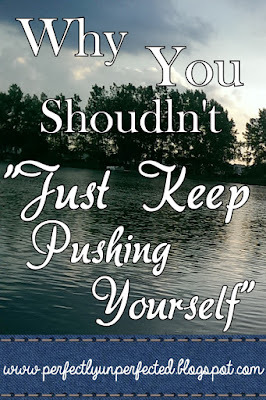 I felt discouraged and angry at myself for not being able to push myself or be motivated. But, then I realized--I wrote ton in March in a short period of time. I then spent the first half of April reading through my manuscript and making notes on needed plot changes and character issues. Then I rearranged my entire plot and marked down which places I needed to add new chapters. While ideally, I would love to sit down and write every single day and never run out of motivation, that's just not realistic. And unfortunately, I hold myself to unrealistic standards a lot. I think a lot of writers do. We look a the writing community and compare ourselves constantly. We see other writers with book deals, other writers with four books under their belt, other writers who can knock out multiple chapters a day, etc. We tell ourselves that writing is what we do, and we need to do it all the time in order to be great and get published. In fact, one of the most common blog post themes I have seen on social media has to do with staying motivated or making yourself write. Yes, I admit, I've posted about motivation before. 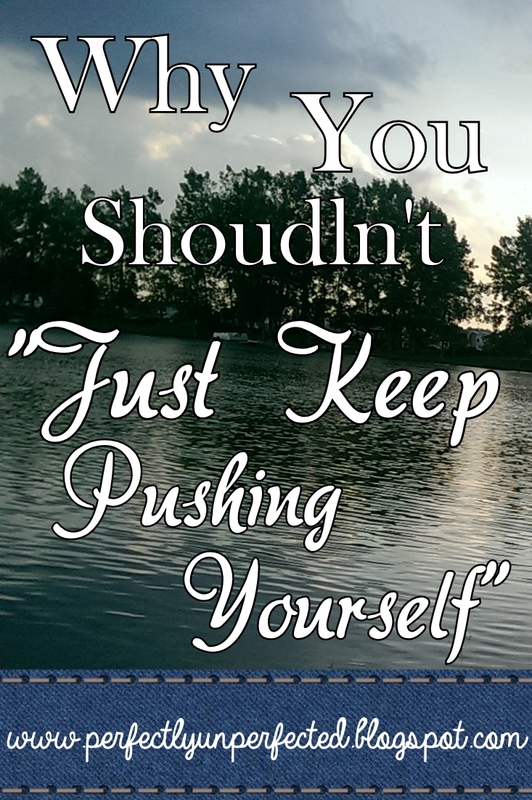 I've passed on the "just keep pushing yourself" advice plenty of times. But you know what? Sometimes that doesn't work. Sometimes we can't write, whether that be due to physical or mental causes. Still, the main advice I hear in response to that is "just keep pushing yourself." My advice? Don't. Writing is hard work. Life in general is hard work. For some reason, feeling unable to take a break seems to be a common issue among writers! Why is that? Why do we push ourselves so hard to the point of exhaustion? For most, it stems from insecurity. I personally feel the need to constantly push myself because it makes me feel validated. It makes me feel more professional and like I'm actively pursuing my goal of becoming published. But in reality, trying to hold myself to unrealistic expectations is an inevitable downfall. Don't get me wrong--there's nothing wrong with writing every day or making goals for yourself. I'm not saying that. What I am saying is that you shouldn't force yourself to write when you're mentally exhausted or need a break. You shouldn't force yourself to write when you've done a lot of work and deserve a break. Like I said before, life is hard! And if you try to make yourself write when you shouldn't, you'll just end up tiring yourself even more. You may be asking yourself, "Well how do I know when I'm pushing myself too hard?" Have I made significant progress lately? Have I been writing every single day? Has all of my free time been spent writing? Do I feel exhausted as soon as I start to write? Does my story feel boring and uninteresting? If you answered yes to every question but the last one, it's time to take a well-deserved break. And by break, I mean at least a week away from your current project. No reading it, no editing it, no writing it. Give yourself a break. Instead, use that time to do other things! Take a walk, go outside, hang out with friends, get coffee, go shopping, watch a movie, etc. Relax. I decided to give myself about a week and a half of time away from my project. At first, it was kind of difficult. I felt like I was failing because I wasn't actively pursuing my goal. I felt like I was going to be judged by others because I was a writer who wasn't writing. I felt like people would stop taking me seriously. But that wasn't true. I quickly realized that the only one holding me to high standards was myself! And that's usually the case with most writers. We hold ourselves to high standards that ultimately lead to our downfall. Sometimes it's good to push yourself. Sometimes it's good to hold yourself to high standards. It's when doing this becomes unhealthy that we have a problem. So listen to your brain! Watch for the signs and ask yourself the questions I listed above. And when you need a break, do not be afraid to take one. Everyone needs a break sometimes, and it's nothing to be ashamed of. You are still a great writer. You will still finish your project. You will still reach your goals. Just take a deep breath, relax, and give yourself a break!